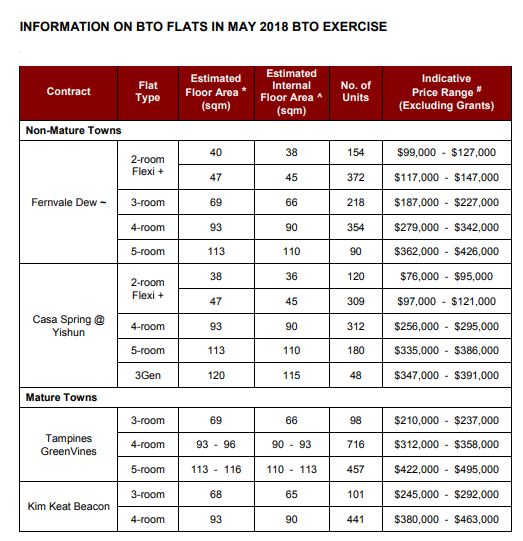 HDB launched 6,992 flats for sale on 22 May under the May 2018 BTO and SBF (Build-To-Order and Sale of Balance Flats) exercise. This comprises 3,970 BTO units and 3,022 SBF units across various towns/estates. HDB said that a wide selection of flats, ranging from 2-room Flexi to Three-Generation (3Gen) flats, is offered in its May 2018 BTO and SBF exercise to meet the diverse housing needs of first-timers, second-timers, multi-generation families, elderly and singles. New HDB flats are priced after taking into account factors such as location, flat attributes and prevailing market conditions. HDB said that its prices are considerably lower than transacted prices of comparable resale flats in the vicinity (see Table 1 for the BTO prices and the comparable resale prices). 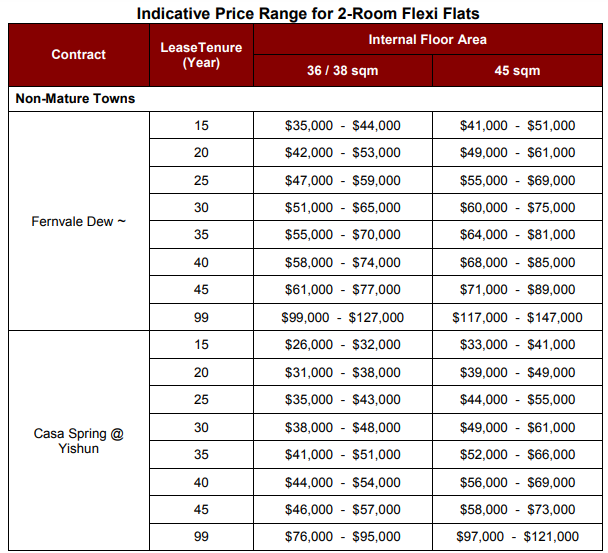 In addition, 2-room Flexi flats are priced taking into account the lease chosen. HDB said that first-timer families will continue to enjoy priority in flat allocation and that married/courting couples who wish to live together with their parent(s) can apply for a 3Gen flat in Casa Spring @ Yishun. Applicants who wish to live close to their parents or married children in the same BTO project can submit a joint application under the Multi-Generation Priority Scheme (MGPS). In addition to the BTO flats, HDB will also offer 3,022 balance flats under the SBF exercise.They comprise 754 units of 2-room Flexi, 655 units of 3-room, 1,143 units of 4-room, 305 units of 5-room, 157 units of 3Gen and 8 units of Executive flats across various towns/estates. The majority of the flats offered under the SBF exercise are reserved for first-timer families. Eligible first-timer singles may also apply for a 2-room Flexi flat in non-mature towns. SBF flats come in a wide range of flat types, locations and selling prices. About 34 per cent are already completed and the rest are under construction. Similar to BTO flats, SBF flats are subsidised and priced considerably lower than the transacted prices of comparable resale flats in the vicinity. Deferment of Income Assessment: Young couples who have not met the minimum period of employment to qualify for housing grants and loans, but are ready to settle down early and buy their first flat, may have their income assessment deferred till just before key collection. The flexibility to defer the income assessment is intended to help young couples proceed with their flat purchase application earlier, if they are ready to make the commitment to settle down. Revised Proximity Condition for Buying a Flat Near Parents/Children: Flat buyers who wish to apply for a flat under the Married Child Priority Scheme (MCPS) and Senior Priority Scheme (SPS) will benefit from the revised proximity condition. Previously, the proximity condition was defined as living in the same town, or within 2 km. Starting from this exercise, applicants may apply for a flat under the MCPS if their parents/married child are living within 4 km of the flat they are applying for. Seniors may also qualify for the SPS if they are buying a 2-room Flexi flat within 4 km of their current flat or owner-occupied private property, or within 4 km of where their parents/married child are residing. This enhancement will provide home buyers more choices of flats in neighbouring towns, and is part of our efforts to encourage families to live closer to each other for stronger mutual support. Application for new flats launched in the May 2018 BTO and SBF exercise can be submitted online on the HDB InfoWEB till 28 May 2018 (Monday). Applicants can apply for only one flat type/category in one town under either the BTO or SBF exercise. Applicants who wish to take up an HDB housing loan for their flat purchase for May 2018 BTO and SBF exercise need to produce a valid HDB Loan Eligibility (HLE) Letter when they book a flat, except for young couples who fulfil certain conditions. HDB encourgaes all applicants to apply for an HLE Letter early so that they can plan their flat purchase in advance. The HLE Letter will indicate the maximum loan that can be offered based on individuals’ financial situation. HDB further advised applicants to apply for a BTO flat in non-mature towns to enjoy a higher chance of success in securing a flat and more housing grants, including the SHG. Although SBF flats have a shorter waiting time to completion, the number of units offered in each town is usually small, and are likely to attract high application rates. Flat applications are not processed on a first-come, first-served basis. HDB will shortlist applicants using a computer ballot. Flat applicants have 7 days to consider and may submit their online application at any time before the closing date. They need not rush to put in their applications. HDB further announced that after the May 2018 BTO and SBF exercise, it will in August 2018,offer about 4,300 flats in Punggol and Yishun. If you are buying a flat in the May 2018 BTO and SBF exercise, the mortgage consultants at icompareloan.com can help you with affordability assessment and a promotional home loan. iCompareLoan Mortgage basically helps home buyers compare Singapore home loans and identify the most ideal for the desired project investment. Not all Singapore mortgage loans are equal and thus there are a range of unique aspects to consider when applying for one. This mortgage advisor’s work is simple: helping you quickly calculate mortgage repayment, compare all bank rates and get in touch with bankers (experienced ones) directly.